Create a dreamy oasis on your property with a grand Amish Western Red Cedar Pergola to define your sitting area. This beautifully handcrafted wooden pergola can be used in many ways. Create a special walkway with the pergola providing shade. Gather under the stars in your own special sitting area, adding outdoor furniture sets underneath your gorgeous pergola. You're sure to be the envy of all neighbors and guests with a Cedar Wood 75" Marlboro Single Mattress Swing Bed featured under your Red Cedar Pergola. When you enjoy the outdoors, your outdoor furniture takes on a special meaning. Set up your pergola today for an outdoor scene you and your family can enjoy for years. We are happy to fit your outdoor space with a custom made pergola. Choose from three custom made sizes. Select the stain you like best. We are happy to provide samples for you to work with. Select curtains for your pergola. 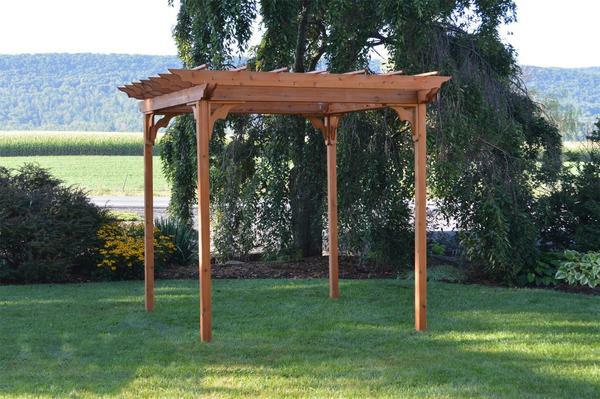 *The Amish Cedar Wood Pergola Kit ships via freight and may require an appointment for delivery.